WASHINGTON — Even after being imprisoned for two years, Pastor Andrew Brunson is hoping to return to Turkey. 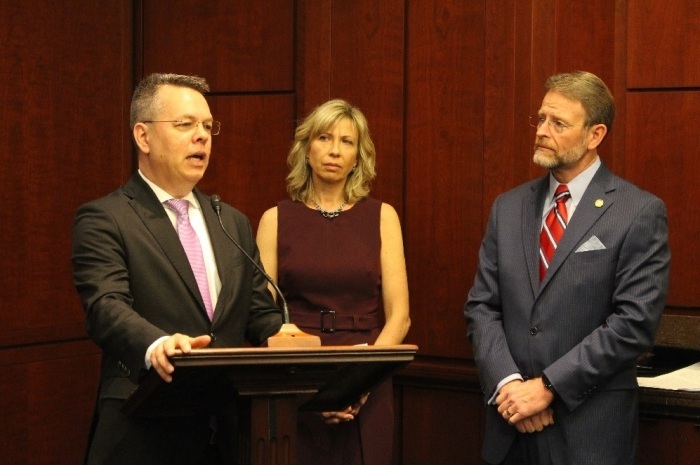 At a small gathering in the Senate Welcome Center at the Capitol Wednesday, the North Carolina pastor who was jailed in Turkey for two years thanked the U.S. Commission on International Religious Freedom for their tireless work to secure his release. It was especially encouraging, he said, to hear from those who visited him while in prison that the U.S. government had not forgotten him. "I don't know how many countries have this kind of emphasis on religious freedom, not just in their own country but trying to advocate for it around the world. I think this is something very unusual, very admirable," about the United States, Brunson said. Brunson's wife, Noreen, also thanked USCIRF staff, saying, "We're aware that not all stories end the way ours did, so just keep up your work." "And we have to give glory to God," she added. Commissioners who were present include: Tony Perkins, president of the Family Research Council; Gayle Manchin, vice chair of the commission, an educator and the wife of U.S. Sen. Joe Manchin, D-W.Va.; Gary Bauer, president of American Values; Nadine Maenza, founding executive director of Patriot Voices; along with USCIRF's newest member, Anurima Bhargava, a civil rights attorney and founder of Anthem of Us. "I think there is going to be more difficulty for the church in Turkey," Brunson added. "There are more restrictions coming right now. There have been a number of missionaries who have been deported from the country. There has been a real dampening effect on the Church; in some ways because a lot of what the [Turkish] media put out about me, which was government supported or initiated, which was painting a very negative picture of Christians, through me, saying, for example, that I'm a terrorist or that Christians support terrorist groups and we want to divide the country," Brunson added. But the truth is the opposite, he said, emphasizing that Christians are praying for their nation and desire to be a blessing to their country. While Christians are undoubtedly facing increased opposition from their government, much of the hostility is directed toward the Fethullah Gülen movement, a transnational Islamic social movement inspired by the teachings of Fethullah Gülen, a Turkish imam who has lived in the U.S. since 1999, Brunson noted. Brunson often shared a cell with people who were accused of being part of that movement and as far as he could tell they were innocent of the charges against them and were not involved in any activity that would undermine the state. "I have many friends in prison in Turkey now who should not be in prison. Many families have been destroyed," he said. Yet despite his ordeal, Brunson maintains that he loves the Turkish people, and that God sent them to that nation 25 years ago. "If we could we would go back, but USCIRF probably doesn't want us to go back," he said, eliciting laughs. "We would love to go back, we love the people, because we believe God loves the people there. And we want to show God's love to them. ... Some day we hope the conditions will be right for us to go back." Perkins praised the couple for rallying the nation around the important principle of international religious freedom. Gayle Manchin explained in an interview with The Christian Post that when they received the news Brunson had been released "we were excited and yet there was this sort of trepidation." "Throughout these two years that he'd been in prison there would be these moments that you thought 'Oh, we've progressed a couple of steps' and then it was to no avail." When Brunson was put on house arrest they were encouraged because they thought it meant he would soon be released. That did not turn out to be true, and the disappointment was compounded by fear that rogue people in the country could harm him while he was on house arrest. "When he was really released, I think everyone just held their breath until he was on that plane and out of their airspace," Manchin said. "If I was feeling that way, I can only imagine how they [Brunson's family] felt having these ups and down through these two years." Manchin stressed that religious freedom is an important American right even for those who practice no religion. "What I would say to these individuals is that you live in country where you don't have to practice a religion. You can be vocal about a nonbelief. And there are many countries that you would go to that you would not be given that right," she replied, when asked about how USCIRF plans to promote its cause in a country where self-described "nones" — those who do not identify with any particular religious affiliation — are rising. Other nations care what the U.S. thinks and want to try to prove that they are better, she added. That USCIRF continues to home in on prisoners that are being held unjustly — because of their religious beliefs — is important human rights work regardless of one's religious views or lack thereof, she said. Manchin is now advocating for a prisoner being held captive in Iran for his spiritual beliefs. Brunson, who was freed in October, famously prayed for President Trump in the Oval Office days after returning to the United States. He is presently working on a book about his experiences which will be published in the fall. The U.S. Commission on International Religious Freedom is a federal government commission created by the International Religious Freedom Act of 1998. USCIRF commissioners are appointed by the president and the leadership of both political parties in the Senate and the House of Representatives.